As already indicated, financial leverage relates to the financing activities of a firm. The sources from which funds can be raised by a firm, from the point of view of the cost/charges, can categorized into (i) those which carry a fixed financial charge, and (ii) those which do not involve any fixed charge. The sources of funds in the first category consist of various types of long term debt, including bonds, debentures, and preference shares. Long-term debts carry a fixed rate interest which is a contractual obligation for the firm. Although the dividend on preferences is not a contractual obligation, it is a fixed charge and must be paid before anything is paid to ordinary shareholders. The equity shareholders are entitled to the remainder of the operating profits of the firm after all the prior obligations are met. We assume in the subsequent discussion that all preference dividends are paid in order to ascertain the operating profits available distribution to ordinary shareholders. Financial leverage results from the presence of fixed financial charges in the firm's stream. These fixed charges do not vary with the earnings before interest and taxes EBIT operating profits. They are to be paid regardless of the amount of EBIT available to pay after paying them, the operating profits (EBIT) belong to the ordinary shareholders. 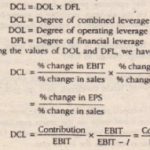 Financial leverage is concerned with the effects of changes in EBIT on the earnings available to equity is defined as the ability of a firm to fixed financial to magnify changes in EBIT on earnings per share. In other words, financial leverage Involves of funds obtained at a fixed cost in the hope of increasing the return to the shareholders. Favorable or positive leverage occurs when the firm earns more on the assets purchase the funds, than the fixed cost of their use. Unfavorable or negative leverage occurs when does not earn as much as the funds cost. Thus, financial leverage is based on the assume the firm is to earn more on the assets that are acquired by the use of funds on which a of interest/dividend is to he paid. The difference between the earnings from the assets fixed cost on the use of the funds goes to the equity holders. In a way, therefore, use interest sources of funds provides increased return on equity investment without additional requirement of funds from the shareholders. Financial leverage is also, therefore, called as on equity. However, in periods or persisting adversity when earnings are not presence of fixed charges. Simply that the shareholders will have to bear the burden, leverage/trading on equity will operate in the opposite direction such that the earning's instead of increasing, will actually fall as a result of the used funds carrying fixed cost.